TAMPA — Forty minutes into Game 2, boos rained down on the Lightning, and continued through the final period. That’s from Diana C. Nearhos of the Tampa Bay Times hinting that this Game 2 loss against Columbus may have been a death sentence for the local team. While it would normally be silly to write off a 62-win team before their fourth loss in a series (not that Nearhos is doing that), especially in a postseason as bonkers as the NHL’s can be, the Lightning somehow regressing in the game after blowing a 3-0 lead at home is certainly not doing them any favors. As for what actually happened during the game, Columbus rode the momentum that a staggering Tampa Bay squad provided after Game 1 to build a 3-0 lead after two periods. Though it was mirrored, the scoreline was a familiar enough site that even the broadcasters were foreseeing a potential Lightning comeback. Five minutes into the final period, it almost looked likely. After nearly every shot coming frustratingly close to going into the net, Mikhail Sergachev finally broke through for Tampa Bay to cut the lead to two. 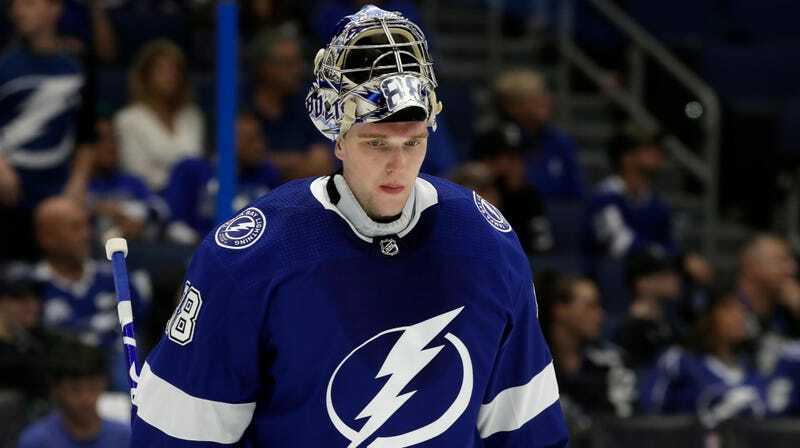 But the dream died less than five minutes later when a lazy pass between Lightning defensemen opened up an opportunity for Columbus’ Riley Nash—whose first goal of the year came very late in the regular season—to slot one right past the ear of Andrei Vasilevskiy. A couple minutes after that, Artemi Panarin made it 5-1 in favor of the Blue Jackets, the eventual final score. It’s an admittedly tough position to be in when the team that’s supposed to come out of the round falls behind to a team that’s objectively not as talented. Expectations make the pressure grow exponentially. Some players are able to acknowledge what went wrong, accept the pressure and use it as a motivating factor for the games moving forward. Other players, like Tampa Bay’s Nikita Kucherov, decided to further hamper their team’s chances by way of a one-game* suspension. Late in the third period, with his team down 5-1 and the loss pretty much guaranteed, Kucherov—who led the Lightning in points this season—decided to trip Markus Nutivaara, who slid into the boards. 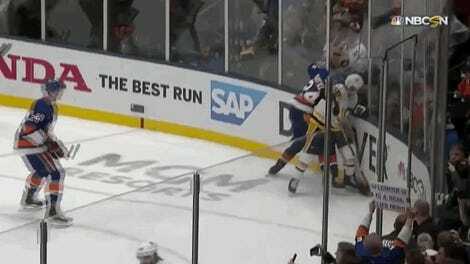 As Nutivaara tried to get up, Kucherov went straight to the downed Blue Jacket and hit his into the boards, again. After the game ended, NHL Player Safety tweeted out that Kucherov would face a hearing sometime on Saturday for his hit. Estimations range from a slap on the wrist to the death penalty because the league isn’t exactly consistent about this kind of stuff. There’s one of two things going on here. Either Cooper doesn’t realize how big a blaze has to be in order for it to qualify as a five-alarm fire—for reference, a five-alarm fire in New York once required about 200 firefighters from 33 departments to put it out—or he’s doing his best impression of Lieutenant Frank Drebin from The Naked Gun and telling people there’s “nothing to see here” while knowing there’s only pure chaos erupting behind him. I’m going to guess it’s the latter.